This B&B is 1.6 km from Bollezeele and 4 km from the centre of Eringhem. It is entirely non-smoking and offers en suite rooms, free Wi-Fi access throughout and a 1-hectare garden. The heated rooms at Pantgat Hof include a seating area and a wardrobe. They also have a bathroom with a shower and a hairdryer. A continental breakfast is served every morning in the breakfast room. Guests can prepare their own meals in a shared kitchenette. There is also a library and a common lounge with a fireplace and a TV. 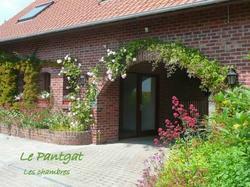 Pantgat Hof is 15 km from Bergues and 22 km from Saint-Omer Cathedral. Free private parking is available on site. This heated room has a seating area. A bathroom with a shower is also provided. This room with wooden ceiling has a seating area. A bathroom with a shower is also provided.